Now is when the cold, wet late winter gardening pays off. If you were out there in February and March poking seeds into the ground or babying transplants, seasonal fresh eating is starting to get really good – especially salads and greens. Lettuces, spinach, kale, arugula, and other greens are lush, crisp, and perfect for salads, with radishes, scallions, chives, pea pods, and nasturtiums to add some color and zing. Most of them thrive in the sunny but cool period between the dark of winter and the hot dry months of summer, so tiny lettuce and spinach starts just sit there in the cold garden for a month or so, then suddenly seem to double in size overnight as the days get brighter and longer. If you planted a lot, you’ll find yourself looking for a larger and larger bowl for your nightly dinner salad – and even then some may start to bolt before you get to them. Successive plantings can help provide a more even harvest, but if you’ve got a glut of greens right now, here are a few suggestions (besides finding yet a bigger salad bowl). Greens – start with a few handfuls of fresh arugula, spinach, kale, collards, parsley, even radish leaves or the green tops of garlic. Unlike basil, most greens will keep their brilliant green color without blanching first, so just rinse them and toss them raw into the food processor (the more substantial leaves of kale or collards can be steamed or boiled first). Olive oil – of course! For a more detailed basic pesto recipe that can be adapted using any of these ingredients, see the Pesto Recipes on our website. Whatever combination you use, pesto is wonderful tossed with pasta, beans, potatoes, or steamed vegetables; spread on pizza or sandwiches (try it on grilled cheese); or as a dip for raw veggies or bread. Another way to take advantage of all the greens from the spring garden is to keep harvesting them as they bolt. Bolting happens when a plant stops putting its energy into producing leafy vegetative growth and sends up a flower to start making seed. Many gardeners assume that once a plant starts to bolt it becomes inedible, and they pull it up and compost it. Many plants do become unpleasant after they send up a flower – lettuce leaves are notoriously bitter once the plants have bolted. However, bolting doesn’t always signal that it’s time to throw a plant in the compost. Spinach, chard, and kale – the flavors of their leaves don’t change much (the plant just won’t keep producing new ones anymore), so go ahead and eat what’s there. Also, you can harvest kale flower buds (before they start to open) and use them like broccoli florets. Arugula, mustard, escarole – these are grown for their strong, peppery or nutty flavors, and their flavors just intensify as the plants send up their flower stalks. 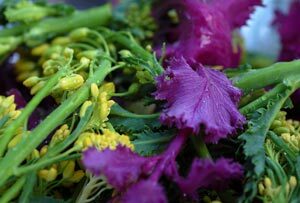 Harvest the leaves that are left, use them as cooking greens if their flavor is too strong raw, and pick the spicy mustard or arugula blooms to add a flash of heat to a salad. Generally, many greens you’d eat raw while they are young, sweet, and tender can be used as cooking greens when they have become tougher and more strongly flavored. Americans tend to eat greens as fresh salads (except perhaps in the south), but in many cultures a side of cooked greens is a daily staple. Horta is a classic Greek dish of warm, boiled greens. In Greece, foragers gather dandelion, nettle, wild brassicas, bolting mustard, and other wild greens from hillsides, fields, or along roadways. Home gardeners can also use chard, arugula, spinach, chicory, watercress, kale, collards, fennel fronds, etc., making the mix as mild or spicy as they like. Tougher and more bitter greens can be used for this dish, because boiling will mellow their flavor. 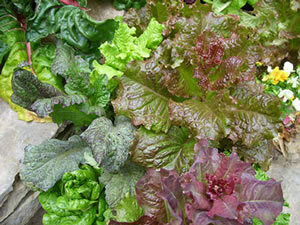 Thoroughly wash the greens, then place in a pan of boiling water and cook for about 8 minutes, or until well blanched. Drain, then chop roughly and season with salt. Place in a salad bowl and toss with a mix of the olive oil and vinegar. Serve warm. 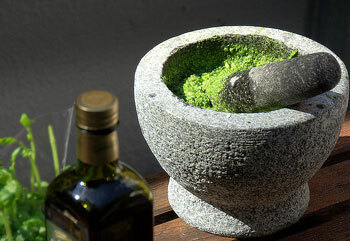 You can also read more about the tradition of making Greek horta in the LA Times food section. Previous issues of Garden News are in the Log House Library.